If you have job interviews coming up, chances are the company is going to be talking to a lot of people. Sometimes 20 or more. 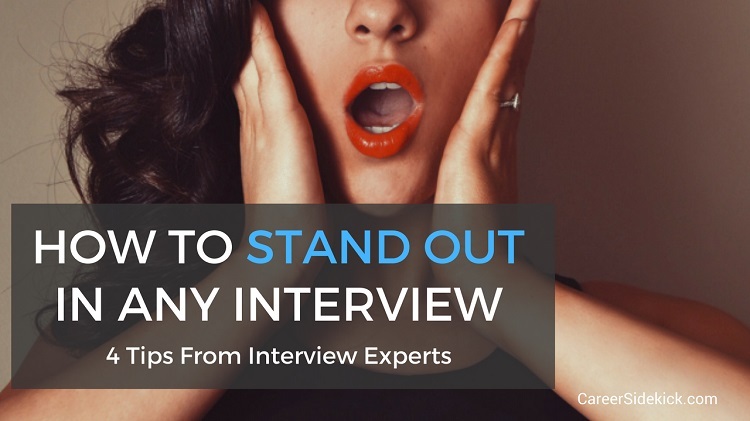 So you need a great way to stand out in your job interviews and separate yourself from everyone else. This article is going to give you 4 proven ways to do this, straight from 4 interview experts… so you can get more job offers in less time. My number one tips for clients is to ensure that you have researched the company very thoroughly. Go into the interview knowing the mission statement, understanding the company’s target market, and knowing more about the history of the business than anyone else. At some time during the interview, the interviewer may ask what you know about the business—if you can’t answer that question, it makes you look like someone that doesn’t care too much about the opportunity. Research can be easily conducted via the company’s website, trade publications, and by asking current employees (if you know any). Being prepared and being someone that can show you are prepared provides the interviewer with the impression you are interested in the potential job, took the time to plan ahead, and care about the outcome. How do you plan to set yourself apart during the interview? While your experience, skills and knowledge should be able to stand alone, I encourage my clients to brand themselves with a Signature Trademark. Mine is coffee. While the focus of my resume/cover letter/interview isn’t coffee, I do mention my soy, sugar-free vanilla latte addiction when appropriate. I brand myself as “a well-caffeinated multipotentialite”—I have a lot of areas of interest and drink plenty of coffee along the way. Doing so shows that I am more than my resume; I am also a person. What’s your Signature Trademark? But when people interview, they often find themselves not being themselves; they put on an Interview Persona (an alternative, more ‘professional’ version of themselves). While this isn’t necessarily bad (if you tend to run late, put on an Interview Person who is early! ), what’s going to happen when you start your new job and your boss learns the ‘real you’? While I am not saying to be unprofessional or to forego social norms around interviewing, I do encourage you to bring your authentic self to the job search process. Yes, you should highlight your passions and interests during your interview, but you should also share your areas of improvement (and not just fake ones that you spice up for interviews). Your honesty will be a breath of fresh air for the interviewer. While you (hopefully) know to send thank you emails immediately after interviews, you should also be sending hand-written (yes, handwritten) thank you notes after every interview (both phone and in-person). Thank you notes provide the interviewer with another touch-point that reminds them of how awesome you are. Since they don’t arrive in the mail until several days after the interview, they are a good way to keep you on the interviewer’s mind. And don’t forget to reference your Signature Trademark in the thank you card! If you want to stand out in your job interview, stop thinking about your job interview as a series of questions you need to answer correctly to “pass”. It’s not a quiz. At least if the company you’re talking to is half-decent, it shouldn’t be. So my best tip to stand out in a job interview is to go in armed with great questions to ask. And don’t wait until the end, mix them into the conversation. You can sometimes end one of your answers with a question. You can find other ways to work your questions into the back-and-forth conversation as well. Ask about the group, current projects, challenges, why they’re looking to hire someone, what direction the company is headed in, and more. Whether you’re going on an in-person interview or phone interview, there are many creative ways to leave a lasting first impression. I always encourage my candidates to spend some extra time compiling what I refer to as a “candidate fit summary”. This document, which can be left behind at an interview or sent via email during a phone interview, is a brief synopsis of your relevant background and core strengths. Tailor it to the job and their needs! And prepare for the interview by reviewing the job description and giving some thought to your specific relevant experience and skill set and how this aligns with what the employer is seeking. Not only does this jog your memory on your core strengths and how they relate to the position, but it shows the interviewer that you took the extra time to prepare and think about how you fit in. If you follow the 4 strategies above, you will be more memorable and stand out in any job interview you go on… whether you’re interviewing first or last! In today’s job market, it’s crucial to set yourself apart because companies are interviewing so many people for each position, so make sure you’re always doing something differently than other candidates to stand out in your interviews.